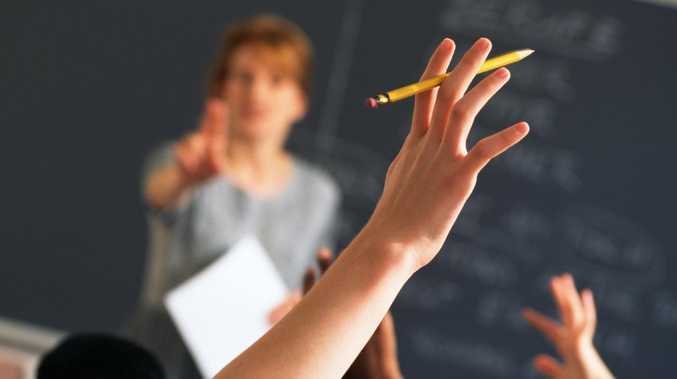 NSW Catholic schools have urged politicians not to rush through changes to the law that allows gay teachers to be sacked. DESPITE the Anglican Church's push to keep hold of its legal right to discriminate against gay teachers and students, the principal of one its most exclusive girls' schools has told parents it already had a "don't ask, don't tell" policy. 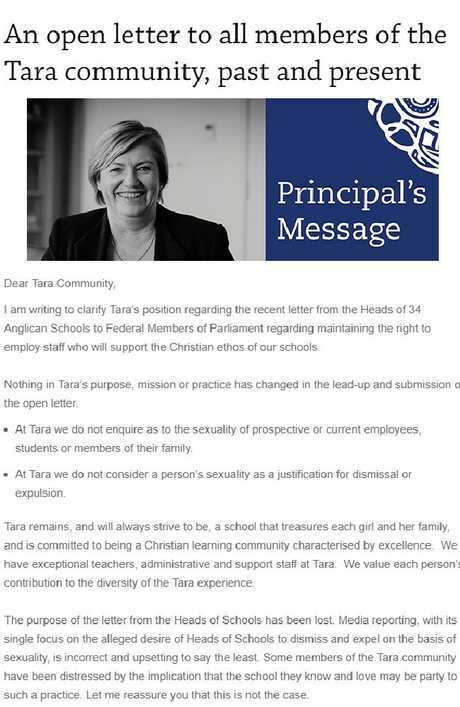 Tara Anglican School for Girls head Susan Middlebrook said members of the school community had been "distressed" by recent reports that implied it would use current religious exemptions to "dismiss and expel on the basis of sexuality". Tara Anglican School for Girls head Susan Middlebrook. 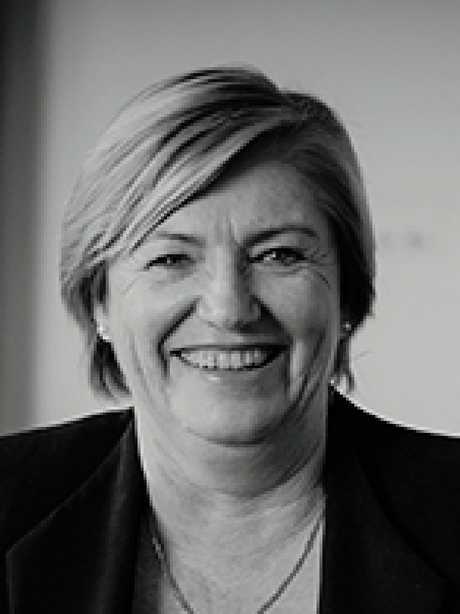 But she said nothing about the school's "purpose, mission or practice" had changed ­because of the recent debate about possible changes to the Anti Discrimination Act to ­remove the exemptions. "At Tara we do not inquire as to the sexuality of prospective or current employees, students or members of their family," Ms Middlebrook wrote in an open letter to "all members of the Tara community, past and present". "At Tara we do not consider a person's sexuality as a justification for dismissal or expulsion." Ms Middlebrook was among 34 Anglican principals who signed a letter sent to all MPs that warned against removing exemptions from the Act granted to religious bodies including schools. 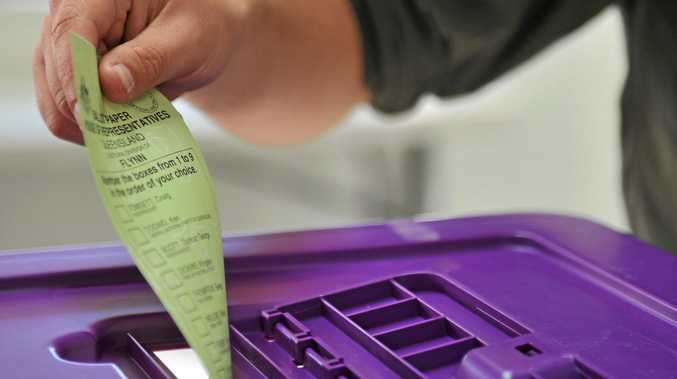 Schools were given the power to discriminate against gay, lesbian and intersex people under 2013 changes to the Act made by the Gillard Government. Debate on the issue flared last month after some details of a federal government review into whether Australian law did enough to protect religious freedoms were leaked, flagging changes to the exemptions. 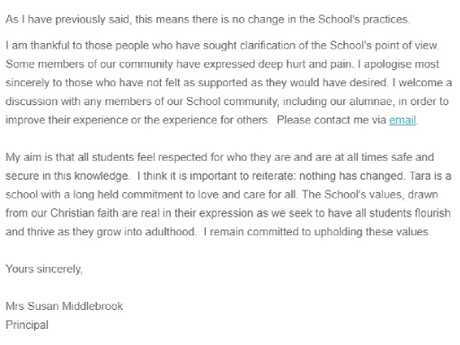 In her letter to parents, Mrs Middlebrook said she was writing to clarify Tara's position and reassure the community "the school they know and love" would not discriminate. 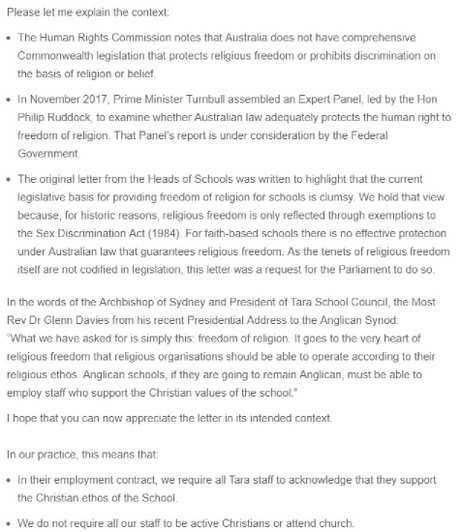 She said the principals' concerns were that the ­exemptions granted in the Anti Discrimination Act were the only legislative recognition of freedom of religion in Australia. Ms Middlebrook said employment contracts at Tara, where parents pay up to $28,000 a year, required them to support "the Christian ethos of the school". 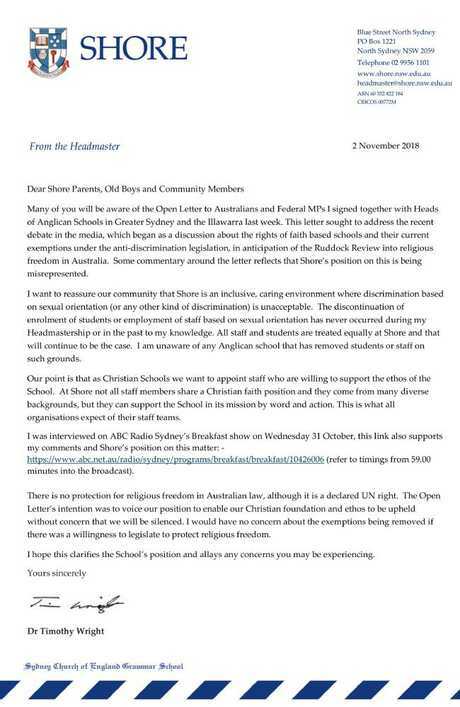 Meanwhile, Anglican Archbishop Glenn Davies described reactions to the principals' letter to MPs as "hysteria". We do not want that right, we never asked for it, don't blame us," Archbishop Davies told The Daily Telegraph. 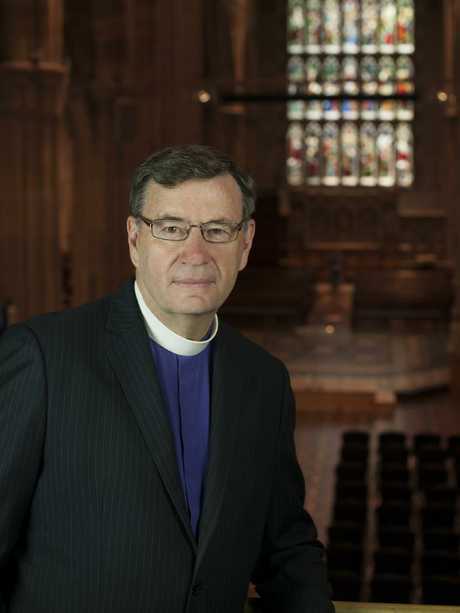 Principals at other top Anglican schools, including Shore Grammar and Mosman Preparatory School for Boys, have also written to parents to reassure them. Letter from Shore Headmaster Dr Tim Wright to parents. The final page of the open letter. 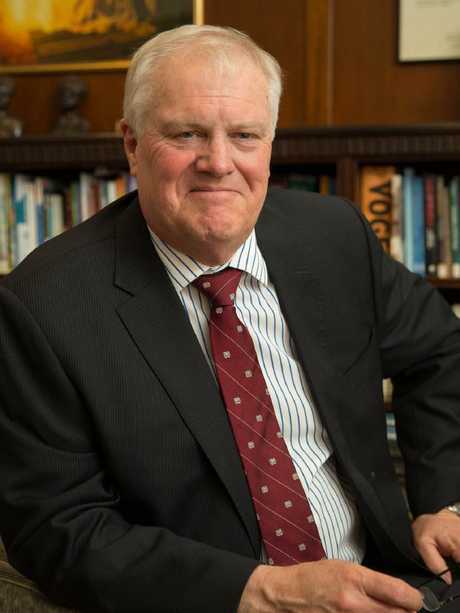 Shore school headmaster Dr Timothy Wright.